Rocking vibrant and ornate Punjabi suits known as salwar kameez, the UC Santa Cruz Bhangra Dance Team, called Apna Virsa, hyped the crowd with their vivacious energy and several attendees lunged forward cheering and dancing on to the dance floor, as if to join the performance themselves. Two of the Bhangra Dance Team, called Apna Virsa, impressed with their high-powered stamina and rhythm. Photo by Sarah Belle Lin. 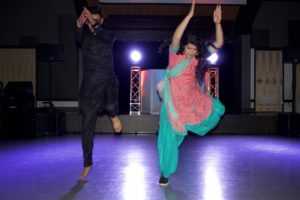 The UCSC Sikh Student Association (SSA) hosted the 5th Annual Bhangra Bash on May 18 at Merrill Cultural Center. The festivities had been in the works since winter quarter. Bhangra is both a popular Punjabi dance form seen in Bollywood movies and culture and the main genre of music at the Bhangra Bash. There are only a handful of Sikh families in Santa Cruz County, said Professor Nirvikar Singh, the current chair of the Sikh and Punjabi Studies program at UCSC. This makes the Sikh student community at UCSC isolated from the closest Sikh population, which is located in San Jose. 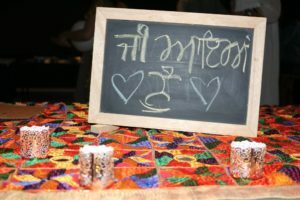 A sign in Punjabi that translates to “Welcome” greets attendees to the Sikh Student Association’s 5th Annual Bhangra Bash. Photo by Sarah Belle Lin. According to Kaur, there are about 100 Sikh-identified students at UC Santa Cruz, but 50-60 actively show up to Sikh events. The event drew about 150 people, including attendees of all ages coming from San Jose and beyond, making it the largest SSA event of the year. Attendees and organizers gushed about the opportunity to meet new and strengthen old connections. “One of the most important things in Sikhism is sangat, which is being with and building relationships within your community,” Kaur said. 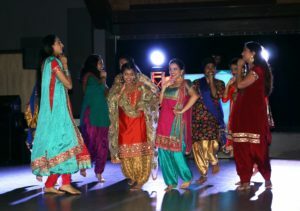 With music spun by DJ AJ, performances took off with the Giddha Dance Team, a storytelling dance form that traditionally showcases the intimate relationships shared between Punjabi women. The all-female dance team opened with a scene of dancers kneeling or standing together in small groups, lightheartedly interacting with one another. The ladies of the Giddha Dance Team reenacted scenes in their performance depicting daily life and the sisterhood of Punjabi women. Photo by Sarah Belle Lin. The Bhangra Dance Team capped the performances and exemplified how the dance form has come a long way from its traditional roots. Bhangra has evolved into a fusion of traditional Bhangra moves, such as arm motions imitating the movement of crops grown during the harvest season, modern hip-hop flow and popular rap beats. Given the inclusivity and acceptance that Sikhism promotes, it came as no surprise that Bhangra Bash was open to the public. SSA appears to have no trouble in outreaching for Bhangra Bash as past years have been successful in bringing in higher ratios of non-UCSC guests to UCSC students. There were around 30 non-UCSC guests who attended this year, according to Pama who also checked guests in at the door. This dynamic led to an interesting turn of events midway through the bash. Three UCSC police officers were called by community safety officers (CSOs) because a group of attendees were acting aggressively, according to UCSC Police Chief Nader Oweis. The situation was resolved after two guests, neither affiliated with UCSC, were given a stay away order and escorted off campus by police officers, as recorded on UCSC police activity logs. Organizers expressed mixed feelings about the commotion that happened outside the venue’s doors. While Pama said he was on edge during the bash because he sensed trouble when several particular outside groups showed up, he was thankful the situation was nothing too crazy. Another organizer joked that police presence was standard at Punjabi events. “You know it’s a real Punjabi party when the cops show up,” said SSA Director of Finance and third-year student Robin Singh Dhaliwal. Despite this slight hiccup, the Bhangra Bash carried on until the clock struck midnight. According to Dhaliwal and SSA President Harsimran Kaur, proceeds from this year’s Bhangra Bash will go toward funding for organizational activities. This includes a fall leadership conference for Sikh students across California and care packages for the houseless and Sikh women who are victims of domestic violence stemming from alcoholism. Dhaliwal has her sights set on throwing an even bigger Bhangra Bash next year, with a prelude in the fall to kick off the official Bhangra Bash in the spring once again. She hopes that by throwing the prelude earlier in the year, this would build momentum for the Bhangra Bash and more people would know and remember who SSA is.